Mike Staffieri sent in this one. "This is a pic of three friends and I together before we separated for the summer after tour. 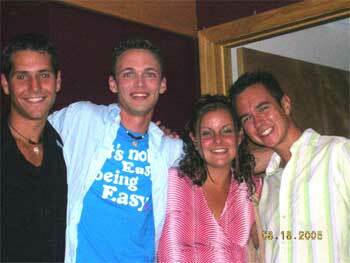 Dave Andrews (our drum major) is on the left, next to me (Mike Staffieri, mellophone '03 and '05, DCI class of '05). I am next to Shannon Dufault (nine-year color guard member at Spartans) and two-year vet Ben Rauhula (pit). We were all going into Boston for the night to celebrate our season and to see our drum major off to college in Florida." Thanks Mike! E-mail your best shots from the summer to dave@dci.org along with where and when the photo was taken. Send some biographical information about yourself as well. We'll give you full credit. Also, let us know if you want your e-mail address included.